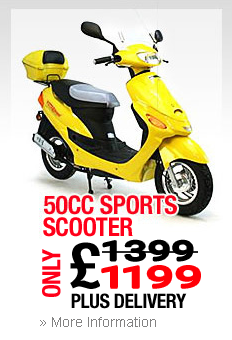 We deliver our 50cc or 125cc scooters direct to you at unbeatable prices. Because there’s no middle man involved, we can keep our prices extremely competitive. 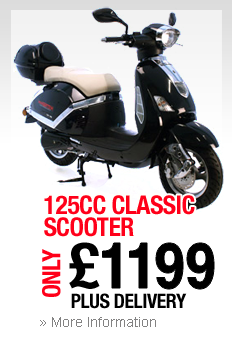 Check it out – you can order your new scooter from us today from as little as £699 plus delivery. 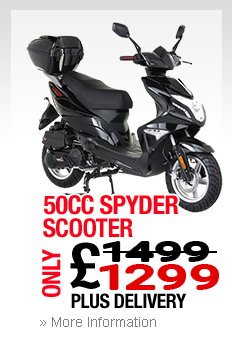 No wonder we’re the number one scooter brand in the country! Browse through our fantastic range to find the style that suits you best. 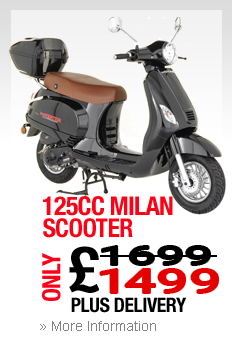 Whether it’s a vintage, retro-look, classic Italian lines or a sportier model, you’ll find your perfect scooter right here. Easy to park and light to handle, they are also great fun to ride. All models are also fully automatic - simply turn on the engine and use the hand operated accelerator to twist-and-go! 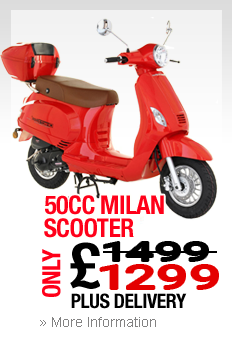 Scooters appeal to all age groups and are ideal for the daily commute, buzzing around town, or cruising down to the coast at the weekend. Not sure which one is for you? 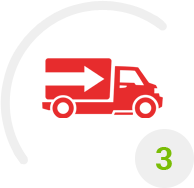 Be sure to use our 360-degree tool to check out the models from every angle and also watch the accompanying video clip to help you decide. 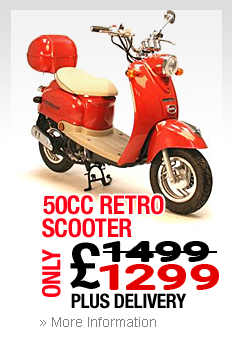 Our range of modern petrol scooters are beautifully designed and finished in eye-catching colours. Manufactured to the highest standards using top quality material, all are sold with a one- year, unlimited mileage warranty. For extra peace of mind, you can take out an extended four-year warranty when you order your scooter. Scooters are available to order in two engine sizes. 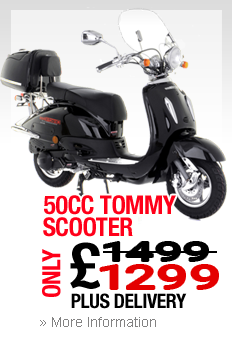 Four stroke 50cc scooters combine economic fuel consumption with great all-round performance and are ideal for using around town. 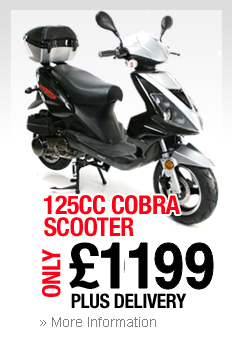 With a top speed of 30mph they are also the perfect choice for first-time riders. 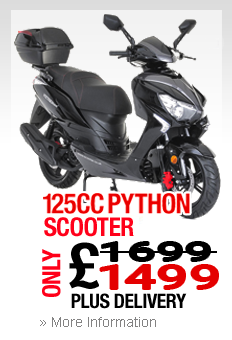 If you’re more experienced or looking for a vehicle that packs more of a punch while still delivering great fuel efficiency, it’s worth considering a four stroke 125cc scooter. Top speed on scooters in this range is 60mph. All models are delivered pre-assembled and with clear operating instructions. 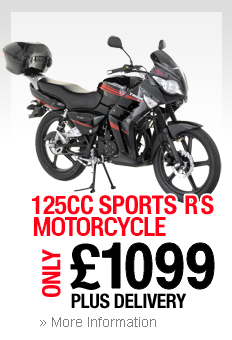 Simply attach the wing mirrors, fit the batteries, add fuel and you’re good to go! 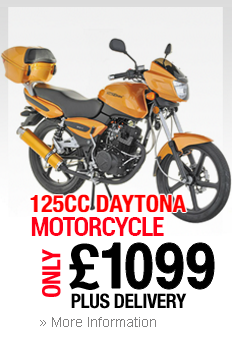 We now also offer a fantastic range of 125cc motorcycles with hand operated clutch and manual transmission. 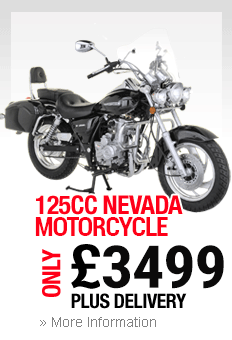 All of our motorcycles have powerful, four stroke fuel-injected engines. Great handling makes these models a joy to ride for both beginners and more experienced riders alike. 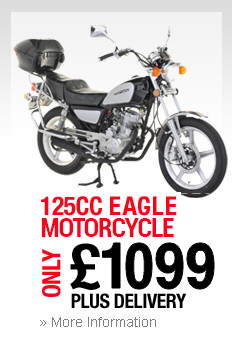 You’re sure to find a motorcycle that’s right for you, whether you’re after the perfect commuter bike like the 125cc Eagle, a laid-back cruiser like the Nevada 125cc motorbike, or something in between. 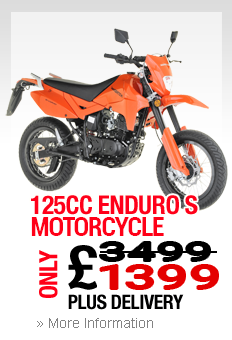 Built to exacting standards, these 125cc motorcycles are designed to deliver outstanding performance and fuel economy plus reliability. All the models in this range come with a year’s warranty, which can be extended for extra peace of mind. 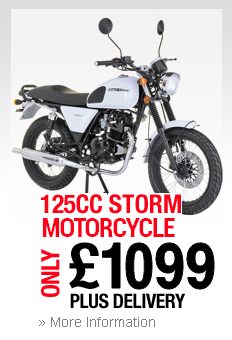 The beauty of these vehicles is that you can still ride them on a CBT, unlike more powerful motorbikes. 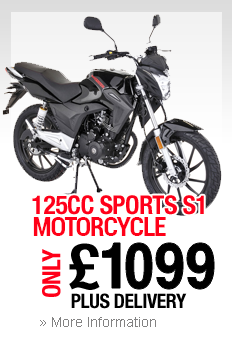 This means that you can start riding them at 17, and they make a great transition between less powerful models, and proper motorbikes that need a full licence to ride. Each one also comes with manual gears, and will likely be the first time you’ve experienced using these. However, they’re really easy to use, and it definitely won’t take you long to become a pro on the roads. We’re confident that you’ll find something to suit your tastes and needs from our fantastic range. 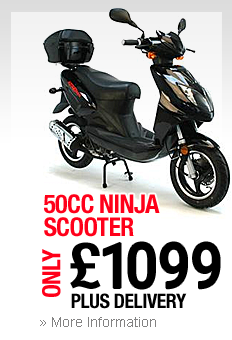 We have now added an exciting selection of electric scooters to our range. Travel in style and comfort, all the while knowing that you’re not contributing to air pollution or depleting precious fossil fuels. Cost-effective and incredibly cheap to run, our electric scooters are available as folding, super lightweight models as well as the Go model, a conventional sit-on scooter. There are no gears to worry about, simply twist the accelerator to control your speed. Easy to operate and very manoeuvrable in traffic, they are ideal for stress-free daily use. Charging couldn’t be easier. Simply recharge at home using a standard plug or at one of the ever-increasing charge points. Battery charging time is up to four hours for the M488 folding models and 12 hours - or overnight - for the bigger Go model. The ultimate when it comes to energy efficiency! Electric scooters are ideal for city dwellers who want a mode of eco-friendly transport that is inexpensive to purchase and run. They are also great for sightseeing and exploring new places. Extremely portable, it can be easily stowed in a car boot and quickly unfolded at your destination. Thanks to its unique folding design, you can carry with you wherever you go. Top speed is 15mph and range is up to 18 miles on a single charge. Our new Go electric scooter with removable battery has a top speed of around 27mph and a range of up to 37 miles on one charge. Go models are road legal vehicles so you’ll need to be 16 or older and be insured to ride one, although you’re exempt from paying road tax. The folding M488 is classed as a personal electric vehicle and isn’t road legal so you don’t need a licence or insurance to ride one. Ordering your new scooter or motorcycle from us couldn’t be easier and can be completed in a matter of minutes. Just click on the model you like – remember to use the 360-degree feature to inspect it from every angle – and then choose from the range of colours for sale. Click through to your delivery options and payment, and you’re done! Once you’ve confirmed your order, your fully assembled scooter or motorcycle will be shipped direct to your door within three working days. If you can’t wait that long to get on the road, you can request special, next day delivery. Here at Direct Bikes, we’re proud to supply customers with the scooter or motorcycle of their choice at the lowest possible prices. 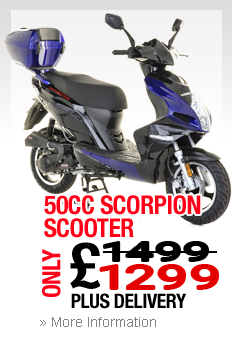 Order your new scooter or motorcycle today! If you order today, you can also take advantage of our great fee offer. Depending on the model you order, we’ll include a free top box (worth £49.99) or a free top box and screen (worth £69.99) with your scooter or 125cc motorcycle. Considering these are both costly and essential parts of any new vehicle, this is an offer that you really don’t want to miss! 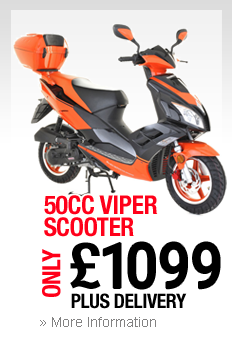 Before you can ride a road legal scooter or motorcycle on UK roads, you’ll have to be fully insured. You can choose from one of three options: third party insurance, third party fire and theft, or comprehensive insurance. Each policy provides different levels of cover and you can also be insured for injuries you may suffer. 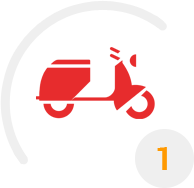 We recommend using Scoot Scoot Insurance to compare low price scooter insurance and motorcycle insurance for Direct Bikes’ customers. 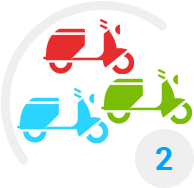 You’ll be able to quickly compare quotes from a panel of leading providers. 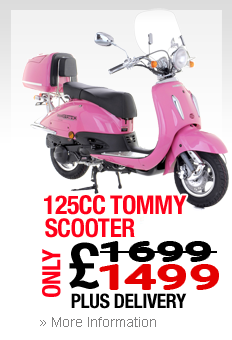 We’re scooter fans too and want to help you find the cheapest insurance without compromising on the quality of your cover. Getting insurance for the first time can be very confusing. In fact, it can be confusing even for seasoned pros. This is why we look to help you find the right cover, because we want it to be as easy as possible, and for you to get on the road so you can enjoy your new vehicle. We help tailor the cover to suit your exact needs, and only use information you’ve already provided as part of your purchase. This takes a massive weight off the whole process, meaning you can focus on being excited to be let loose on the road. 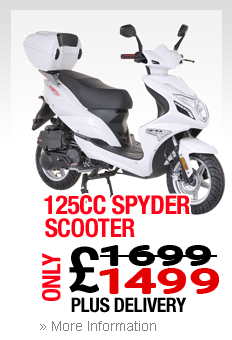 For simple, impartial comparisons at the lowest price, click on the scooter insurance tab above. We now offer finance for all our Direct Bikes scooters and motorcycles. 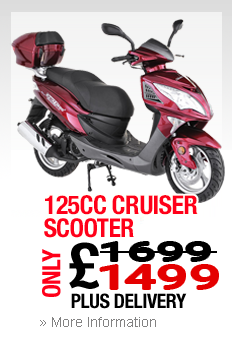 This means you can spread the cost of your scooter finance or motorbike finance over months or years, whichever suits your pocket best! 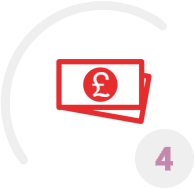 Find out more about our competitive rates for finance that will help to keep your costs down. Simply fill in the online application by clicking on the finance tab at the top of the page. Much like our insurance offer, we want everything to be as simple as possible, and applying for finance can be notoriously complicated. We’ve made every effort to streamline the process, and to make everything clear and accessible. Applying for finance is straightforward and you’ll have a quote for finance in next to no time. If you have any queries, you can email us or call 0845 6520680. We supply our scooters direct from the factory, cutting out the middleman. We also avoid glossy brochures, fancy showrooms and aggressive salesmen. Because we keep our overheads low, we can pass the savings on to you.